Seega, or Sija (سيجة), as it is pronounced in Arabic, is an ancient Egyptian game, whose origins are unclear. There are carved Seega boards on a few different Egyptian temples, dating all the way back to the 1300s BCE, but it is not clear if the boards have been carved at the time of the temple’s construction or later in history. Seega has been continuously played in Egypt since the ancient times until today and its rules are known. 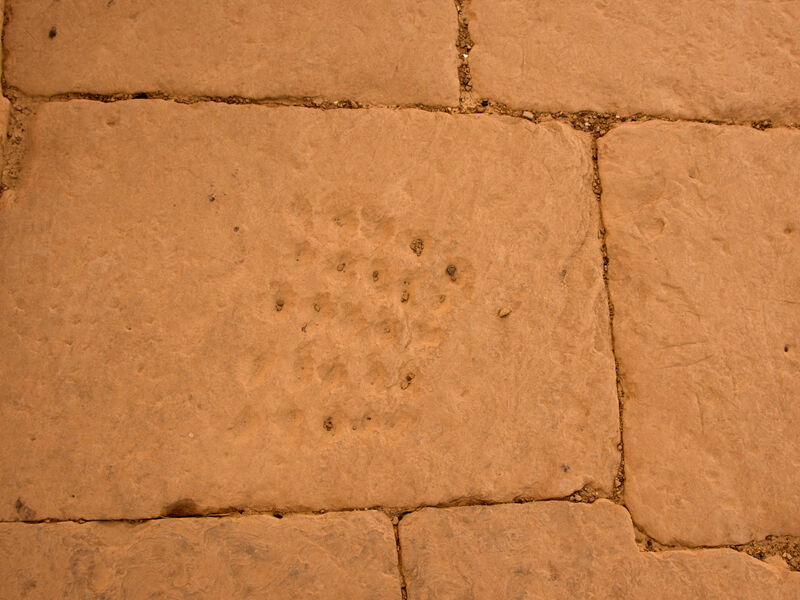 Seega game board, carved on the wall of Elkab Temple of Amenhotep III, Elkab, Egypt. Photo: Bruce Allardice, July 2, 2013. Rules for Seega have been published for the first time in 1836, in a book by Edward William Lane, called “An Account of the Manners and Customs of the Modern Egyptians”. Lane traveled to Egypt twice, in the 1820s and 1830s, and observed Egyptian Bedouin and Felaheen (peasants) play various games, whose rules he recorded. Lane noted that the Egyptians employ various strategies while playing Seega, but he did not know what they were. In 1890, after Lane’s death, H Carrington Bolton, published strategy analysis for Seega in an article called “Seega, an Egyptian Game”. Finally, in 1892, both Lane’s and Bolton’s work have been combined in a general book about board games by Edward Falkener, called “Games Ancient and Oriental, and How to Play Them”, which popularized various ancient games in the western world. Another Seega game board, carved on the wall of Elkab Temple of Amenhotep III, Elkab, Egypt. Photo: Bruce Allardice, July 2, 2013. Since Seega is a game of the Egyptian poor and nomads, it did not have fancy manufactured boards and pieces, as opposed to games like Senet, Aseb, Mehen, and Hounds and Jackals, all of which were the games of royalty and the wealthy. 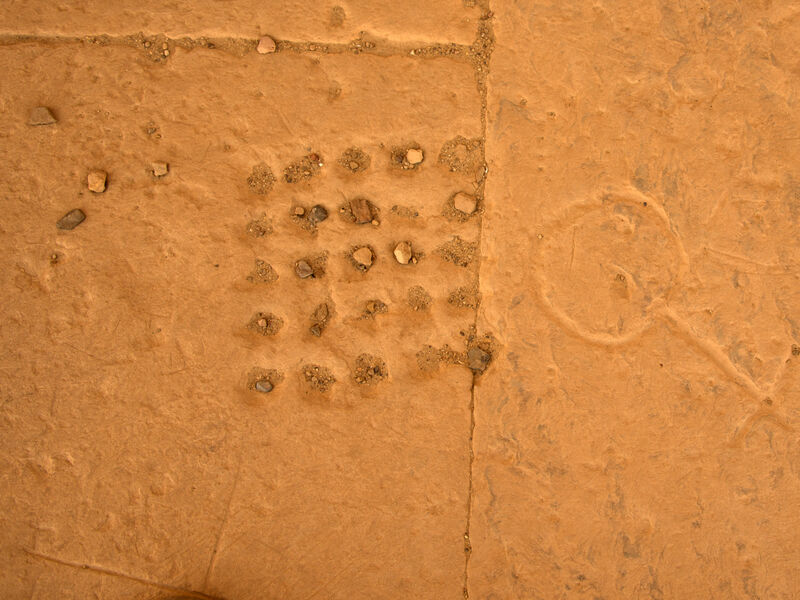 The Felaheen and the Bedouin simply dug holes in the sand to make a temporary playing board or carved them into rocks, and used pebbles of two different colors to play. It has been my observation, that in Egypt, for whatever reason, the wealthy preferred games of chance, where as the poor preferred games of strategy without a chance component. Seega is a 2 player game. It consists of a board with a 5×5 grid and 24 playing pieces of two different colors, 12 pieces per player. The 5×5 version is called Khamsawee Seega, meaning Five by Five Seega. There are variations of Seega that are played on a 7×7 board with 48 pieces, 24 pieces per player, called Sebawee Seega, meaning Seven by Seven Seega, and a 9×9 board with 80 pieces, 40 pieces per player, called Tisawee Seega, meaning Nine by Nine Seega. The rules are exactly the same for all versions and the only difference is the length of the game due to a larger number of pieces. Each cell on the board is called Ein, meaning in Arabic “eye”. Each piece is called Kelb, meaning in Arabic “dog”. All pieces begin off the board. The players decide who starts first by agreement or a throwing a lot, such as a toss of a coin. Each player takes a turn and places two pieces at a time into any empty cells they chose, except for the center cell. Once all of the pieces have been placed the players take turns moving one piece at a time from an occupied cell into empty cells. Each player tried to sandwich an opponent’s piece between two of their pieces. If the opponent’s piece gets sandwiched between two of the players pieces then that piece gets knocked out and is removed from the board. Pieces can only move horizontally or vertically, and not diagonally. Pieces can only be sandwiched horizontally or vertically, and not diagonally. The sandwiched piece gets only knocked out if the player made a move to sandwich it with one of their pieces. If a player’s piece enters a cell which positions it in between two of opponent’s pieces then it does not get knocked out. If a player can knock off multiple pieces in subsequent moves then they can make as many moves in a row as will allow them to knock off the opponents pieces. Otherwise, additional moves cannot be made by the same player. A player can knock off multiple pieces of the opponent in a single move if all of those pieces get sandwiched simultaneously. The center cell is a safe cell. If a piece is sitting on it it cannot get knocked out even if it gets sandwiched by two of opponent’s pieces. Pieces can only move one cell at a time and cannot skip cells or jump over other pieces, whether their own or opponent’s. The same piece cannot move back and forth on the same cells more than twice. If one player’s pieces get trapped so that they cannot make any moves then the opponents keeps taking turns until they either free up cells for the player to move or the opponent must remove one of their pieces off the board to allow the first player to move. The goal of the game is to knock out all of the opponent’s pieces. The player all of whose pieces get knocked out looses the game and the opponent is the winner. If a stalemate occurs where it becomes impossible to knock out all of the opponents pieces, then the game ends and the winner is the player who has more pieces on the board than the opponent. In a 5×5 Seega this may occur when the loser has only one piece left. In a 7×7 Seega this may occur when the loser has 7 pieces left. In 9×9 Seega this may occur when the loser has 11 pieces left. It is still possible to capture the opponents pieces at that stage of the game, but it may take a very long time. Therefore, if the players want to shorten the game they may agree for the player with less pieces to simply surrender. There is a variation in the game where the first two placements cannot be made on any cells of choice. 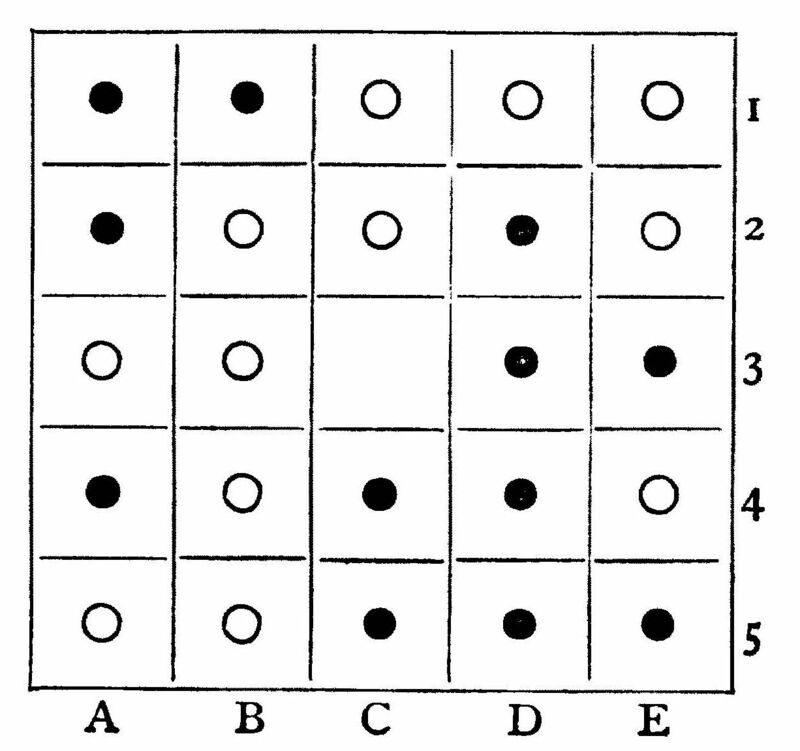 The first player specifically places two of their pieces on cells A3 and E3, and the second player follows by placing two pieces specifically on cells C1 and C5. After that pieces can be placed into any cells the players chose, except for the center cell C3. This variation was recorded by Lane in Egypt proper, where as the primary rule not having this restriction was recorded by Bolton in St. Catherine’s Monastery in Sinai. During initial placement, the player should always try to occupy at least one cell (preferably two) adjacent to the center cell, so that they can move into it once the movement of pieces begins and they do not get trapped and lose two of their pieces in the first moves of the game. After occupying two cells adjacent to the center, each player should try to occupy as many cells on the outside rows as possible, because this will allow them to move towards the center and trap opponents pieces. If both players have the same number of pieces it is advantageous to try to trap the opponent’s pieces so that they cannot move. Lane, Edward William. An account of the manners and customs of the modern Egyptians: written in Egypt during the years 1833,-34, and-35, partly from notes made during a former visit to that country in the years 1825,-26,-27, and-28. J. Murray, 1860. p. 349-350. Bolton, H. Carrington. “Seegà, an Egyptian Game.” Journal of American Folklore (1890): 132-134. Falkener, Edward. Games Ancient and Oriental: And how to Play Them; Being the Games of the Ancient Egyptians, the Heira Gramme of the Greeks, the Ludus Latrunculorum of the Romans, and the Oriental Games of Chess, Draughts, Backgammon, and Magic Squares. Longmans, Green and Company, 1892. p. 63-71. Botermans, Jack. The book of games: strategy, tactics & history. Sterling Publishing Company, 2008. Was doing a paper on this ancient game and this page proved to be lots of help! Really concise and informative points. Thanks a bunch! Great to be helpful. Thank you. Regarding the hypothesis that the wealthy preferred games of chance, I’m not sure that this is true. Although Mehen is often shown in modern books and websites with dice of various sorts, it has never been found with dice that cannot be ascribed to Senet nor do any pictures or descriptions imply that it was played with dice. Wherever it is found by itself, there are no dice and the wonderful picture in the tomb of Hesy-re also shows dice only with the Senet game. The game of Men, too appears not to have used dice, although less is known about this. I think it’s also true to say that ordinary people appear to have played the Game of Twenty Squares. But all these things are open to interpretation. I want to add that your site is a fantastic resource; thanks for lots of useful and inspiring information. Thank you. I do agree with you that a lot of this is speculation. We just don’t have enough information to really know for sure. Hey Buddy!, I found this information for you: "Seega, سيجة (Al-Sija)". Here is the website link: https://www.ancientgames.org/seega/. Thank you.